Average insurance rates for a 2004 Toyota Camry are $1,010 a year for full coverage. Comprehensive costs on average $152, collision costs $226, and liability coverage costs $474. Buying a liability-only policy costs as little as $522 a year, with high-risk insurance costing around $2,182. Teenage drivers receive the highest rates at $4,100 a year or more. Rate data is compiled from all 50 U.S. states and averaged for all 2004 Toyota Camry models. Rates are based on a 40-year-old male driver, $500 comprehensive and collision deductibles, and a clean driving record. Remaining premium consists of UM/UIM coverage, Medical/PIP, and policy fees. For a driver in their 40's, prices range go from as low as $522 for basic liability insurance to the much higher price of $2,182 for a driver who has had serious violations or accidents. These differences show why everyone should compare rates based on a specific location and risk profile, rather than using average rates. Are you intimidated by the wide range of insurance options? Many other consumers are too. You have so many choices that it can quickly become a real challenge to find lower rates. It’s a good habit to check insurance prices once or twice a year due to the fact that insurance rates are adjusted regularly by insurance companies. Even if you think you had the best rates on Camry insurance a couple years back there may be better deals available now. You can find a lot of wrong information about insurance on the internet, so we’re going to give you some tested techniques to reduce your insurance bill. There are multiple methods to compare 2004 Toyota Camry auto insurance quotes, but some are easier and takes less work. You could waste time driving to local insurance agents in your area, or you could save time and use the internet to get rate comparisons in just a few minutes. Many popular insurance companies participate in a marketplace that allows shoppers to enter their coverage request one time, and every company provides a quote. This system prevents you from having to do quote forms to each company. To find out what other companies charge for 2004 Toyota Camry insurance click to open in new window. The one downside to using this type of form is that you can’t choose the insurers to get quotes from. So if you want to select individual companies to request quotes from, we have a page of auto insurance companies in your area. Click here for list of insurance companies. It’s up to you how you get prices quotes, just ensure you are comparing apples-to-apples coverages and limits on every quote you get. If the quotes have different values for each quote you can’t possibly find the best deal for your Toyota Camry. Just a small difference in limits could mean much higher rates. It’s important to know that quoting more will increase your chances of finding the best rates. Companies do not advertise all their discounts very well, so here is a list both the well known and the more hidden insurance coverage savings. Seat Belt Usage – Requiring all passengers to use their safety belts can save up to 15% on the medical payments or PIP coverage costs. Anti-lock Brake Discount – Vehicles with anti-lock braking systems can reduce accidents and earn discounts up to 10%. Early Switch Discount – Select companies give a discount for switching policies prior to your current policy expiring. It’s a savings of about 10%. Theft Prevention Discount – Anti-theft and alarm systems prevent vehicle theft and therefore earn up to a 10% discount. Own a Home – Owning a house may trigger a insurance coverage policy discount because maintaining a house requires personal responsibility. Multiple Cars – Buying insurance for all your vehicles with the same company may reduce the rate for each vehicle. A little note about advertised discounts, some of the credits will not apply to the overall cost of the policy. A few only apply to the cost of specific coverages such as collision or personal injury protection. So even though they make it sound like adding up those discounts means a free policy, companies wouldn’t make money that way. Before buying, ask each insurance company which discounts you may be entitled to. All car insurance discounts might not apply in your state. When it comes to buying adequate coverage, there really is no best way to insure your cars. Everyone’s situation is a little different. Here are some questions about coverages that could help you determine whether or not you may require specific advice. How much can I save by bundling my policies? Am I covered when driving someone else’s vehicle? What vehicles should carry emergency assistance coverage? Am I covered when renting a car or should I buy coverage from the car rental agency? Does my policy cover my teen driver if they drive my company car? Am I covered if I hit my neighbor’s mailbox? Do I need medical payments coverage since I have good health insurance? Do I have coverage when pulling a U-Haul trailer? If you can’t answer these questions but one or more may apply to you, you might consider talking to a licensed agent. If you want to speak to an agent in your area, take a second and complete this form. Consumers need to have an understanding of the rating factors that help determine insurance rates. Having a good understanding of what determines base rates empowers consumers to make smart changes that could result in much lower annual insurance costs. The following are some of the factors used by your company to calculate premiums. Clean credit earns discounts – Credit history is a important factor in determining your rates. If your credit history is not that good, you could potentially save money when insuring your 2004 Toyota Camry by improving your credit score. People with high credit scores tend to be more responsible than drivers with lower credit scores. Too many insurance claims drive up costs – If you frequently file small claims, you can expect higher rates. Companies provide discounts to people who file claims infrequently. Insurance coverage is intended for the bigger claims that can’t be paid out-of-pocket. Lower rates with optional equipment – Owning a car with an alarm system can get you a discount on your insurance. Anti-theft devices like vehicle immobilizer systems, General Motors OnStar and LoJack tracking systems can help prevent car theft. Occupation reflects on rates – Occupations such as real estate brokers, social workers and financial analysts are shown to have higher average rates attributed to high stress levels and long work hours. Conversely, professions such as farmers, engineers and the unemployed pay the least on Camry insurance. Multi-policy discounts can save money – The majority of insurance companies will award you with lower prices to customers who have multiple policies with them such as combining an auto and homeowners policy. Discounts can be 10 percent or more. Even though this discount sounds good, it’s in your best interest to shop around to verify if the discount is saving money. Women pay lower rates – The statistics show women are more cautious behind the wheel. However, don’t assume that women are better drivers. Women and men are in accidents at about the same rate, but the male of the species cause more damage and cost insurance companies more money. Men also tend to receive more costly citations such as reckless driving. Discounts for married couples – Getting married actually saves money on your insurance policy. Having a significant other translates into being more mature and it’s statistically proven that drivers who are married are more cautious. Do drivers who switch really save $421 a year? Companies like Progressive, Allstate and GEICO constantly bombard you with ads in print and on television. All the ads make an identical promise about savings if you switch your coverage to them. How can each company say the same thing? This is how they do it. All the different companies are able to cherry pick for the type of customer they prefer to insure. For instance, a preferred risk could be between the ages of 40 and 55, has no tickets, and has excellent credit. Any driver who meets those qualifications will qualify for the lowest rates and most likely will save a lot of money. Consumers who fall outside the requirements must pay higher prices which leads to business not being written. Company advertisements say “customers that switch” but not “drivers who get quotes” save that much money. That is how insurance companies can confidently advertise the savings. This illustrates why drivers should get as many comparisons as possible. It’s not possible to predict which insurance company will give you the biggest savings on Toyota Camry insurance. Knowing the specifics of your policy aids in choosing the best coverages and the correct deductibles and limits. The terms used in a policy can be ambiguous and nobody wants to actually read their policy. Comprehensive insurance covers damage caused by mother nature, theft, vandalism and other events. A deductible will apply and the remainder of the damage will be paid by comprehensive coverage. Comprehensive can pay for things such as theft, fire damage and a tree branch falling on your vehicle. The most your insurance company will pay is the market value of your vehicle, so if your deductible is as high as the vehicle’s value it’s not worth carrying full coverage. Collision coverage pays for damage to your Camry resulting from a collision with another car or object. A deductible applies then the remaining damage will be paid by your insurance company. Collision coverage pays for claims like sideswiping another vehicle, crashing into a ditch, rolling your car and hitting a mailbox. Paying for collision coverage can be pricey, so consider removing coverage from lower value vehicles. 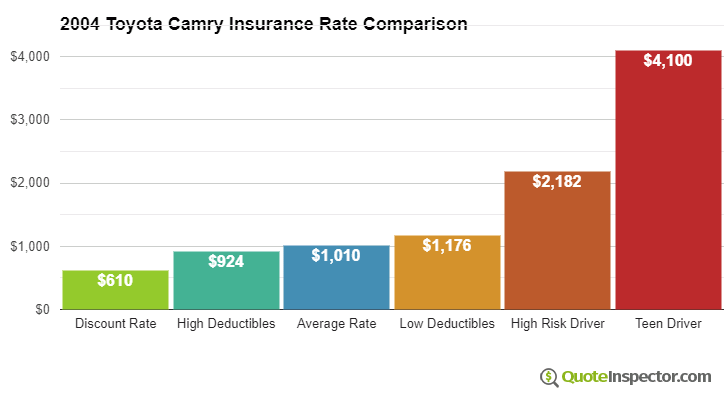 Another option is to increase the deductible to save money on collision insurance. Uninsured or Underinsured Motorist coverage protects you and your vehicle from other drivers when they either are underinsured or have no liability coverage at all. Covered losses include medical payments for you and your occupants as well as your vehicle’s damage. Because many people have only the minimum liability required by law, their liability coverage can quickly be exhausted. So UM/UIM coverage should not be overlooked. Liability insurance will cover damages or injuries you inflict on other’s property or people by causing an accident. This coverage protects you from claims by other people, and does not provide coverage for your own vehicle damage or injuries. Split limit liability has three limits of coverage: bodily injury for each person injured, bodily injury for the entire accident and a property damage limit. As an example, you may have limits of 50/100/50 which means a $50,000 limit per person for injuries, a total of $100,000 of bodily injury coverage per accident, and property damage coverage for $50,000. Liability coverage pays for things such as legal defense fees, emergency aid and repair costs for stationary objects. How much liability should you purchase? That is a personal decision, but it’s cheap coverage so purchase higher limits if possible. While you’re price shopping online, it’s very important that you do not reduce coverage to reduce premium. There are a lot of situations where consumers will sacrifice full coverage only to regret at claim time they didn’t purchase enough coverage. The aim is to buy the best coverage you can find for the lowest price while still protecting your assets. Insureds leave their current company for any number of reasons including being labeled a high risk driver, lack of trust in their agent, delays in responding to claim requests and even unfair underwriting practices. Regardless of your reason for switching companies, finding a new insurance company is actually quite simple. Cost effective 2004 Toyota Camry insurance can be bought both online and with local insurance agents, and you need to price shop both in order to have the best chance of saving money. Some insurance providers do not offer the ability to get a quote online and usually these smaller companies provide coverage only through local independent agents.